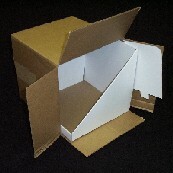 The best selection of in-stock cardboard and corrugated point of purchase displays on the internet. 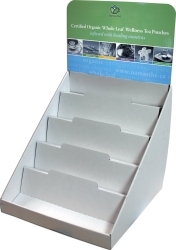 Stock displays ready to ship! Worlds largest selection of Cardboard Displays! 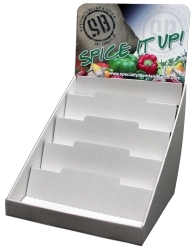 Your display reflects the quality of your product! 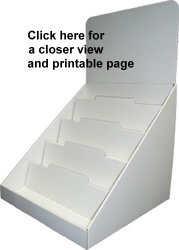 Blank Display & Header Cost $10.40 ea. $8.91 ea. $7.80 ea. $6.93 ea. $6.24 ea. $5.67 ea. Add Graphics to Full Header (Add to cost)* $5.47 ea. $4.97 ea. $4.56 ea. $4.21 ea. $3.91 ea. $3.65 ea. Add Graphics to Front Lip (Add to cost)* $2.54 ea. $2.31 ea. $2.12 ea. $1.96 ea. $1.82 ea. $1.69 ea. 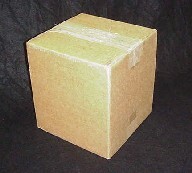 Shipper Box $2.49 ea. $2.49 ea. $2.49 ea. $2.49 ea. $2.49 ea. $2.49 ea. Please Note: Most in-stock displays without graphics will be shipped within 2-3 working days via standard ground shipping unless otherwise specified. For orders that include graphics: The standard lead-time is 2-3 weeks production following receipt of final useable artwork. Rush orders are available. 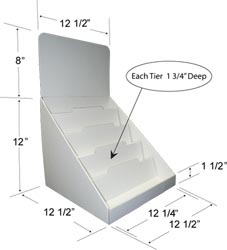 All displays and shipper boxes are shipped flat in bulk (Not assembled). Freight/shipping costs will be added. We ship by UPS, FedEx and/or Truck Service. 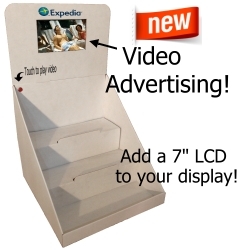 Add our new pedestal to this counter display to make it a floor display as well!